Saturday was a crazy day. J’s mom had flown in from Florida to help me with after school care while J was in Las Vegas. She still has a couple more weeks down there before moving back up to St. Joseph County for the warm months. She flew Allegiant this time because there is a direct flight between Punta Gorda and Grand Rapids…and it was cheap. Her flight Saturday morning left Grand Rapids at about 10:30. We had to get the kids up and get them in the car so we could get Nana to the airport in time. That would be the first of our two airport trips that day. You see, J’s flight from Las Vegas to Kalamazoo on Friday was cancelled the quickest way for her to get home was to fly in to Grand Rapids at 5:00 Saturday evening. There was no way I could kill all day with the kids so we just made the trip twice. We dropped Nana off curbside at the airport, said our good-byes, then headed back towards home. When we got close to Plainwell I asked the kids if they would want to stop for breakfast. Both of them said yes, so I pulled off the highway at 106th Street and headed towards downtown Plainwell. I knew there’s a couple of diners close to downtown so I just figured we’d stop at the first one we hit. 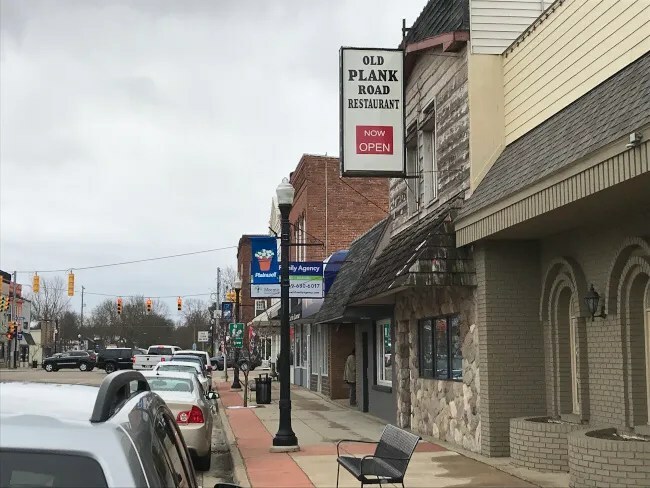 We found a spot to park on the street on North Main Street then walked a few doors down to Old Plank Road Restaurant. 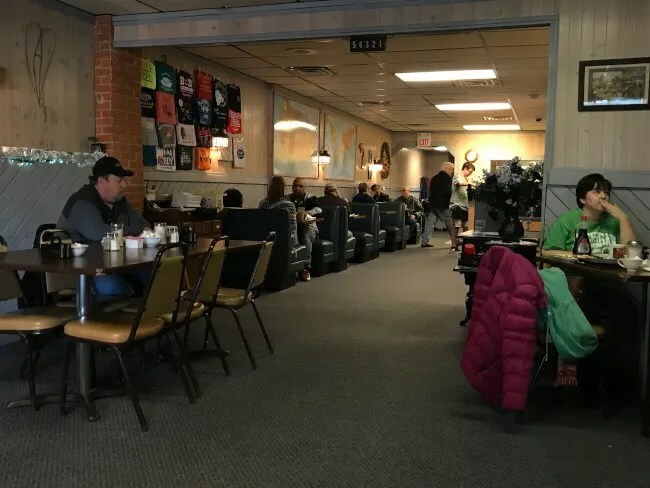 The diner is right along the busy stretch of town and is tucked into an old wood building with a stone facade. I looked in the window and saw some open tables so we headed in. There is a rather large dining room but there’s a lot of open space too. There are booths along the walls in the back and tables in the large, wider area near the front. The place is lit with fluorescent lights but the shops dark colored carpets eat up that light leaving the place feeling a little dark. We found a table near the front and the waitress saw us sit down right away. She grabbed some menus and took drink orders. I let each of the kids get a Sprite and I got a Coke. By the time she came back, everyone was ready to order. 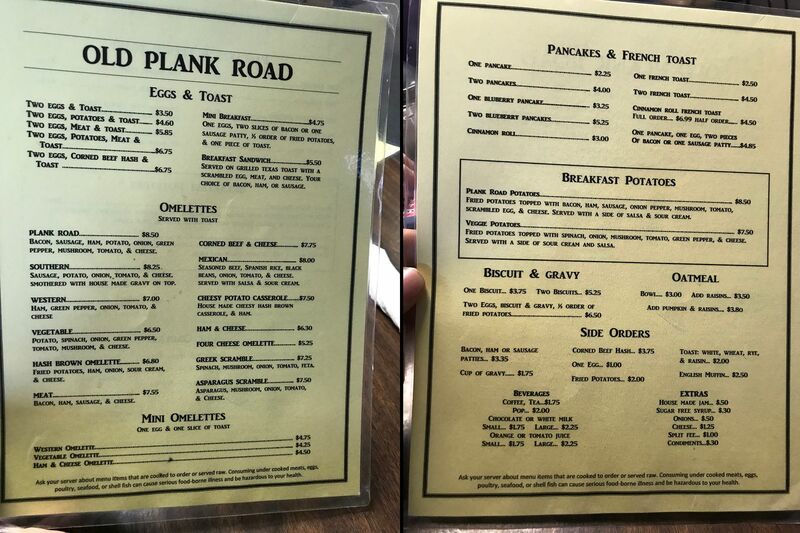 Old Plank Road only does breakfast now so there’s not even lunch options available. According to a sign on the door, they’re closed by 11:30 am daily. The menu is very simple. 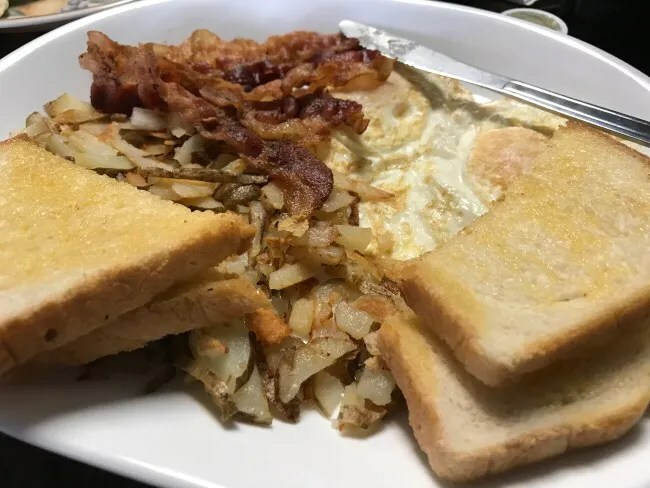 There’s nothing on that really stands out…just the common breakfast foods you expect to find at every greasy spoon diner. I ordered Two Eggs, Potatoes, Meat, and Toast. 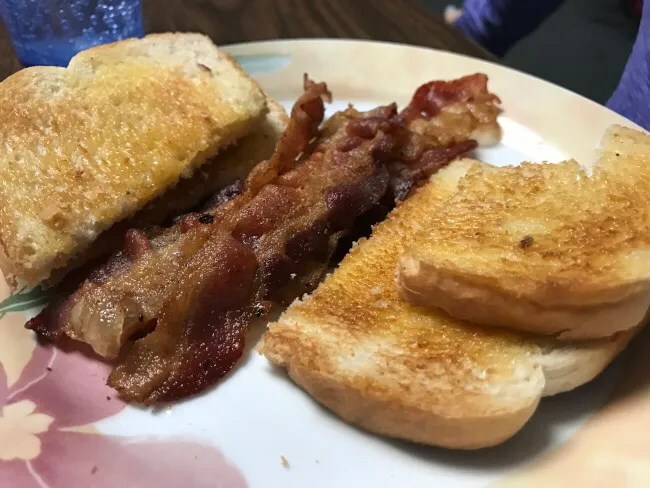 My meat was bacon and my toast was white. The plate was full of diner classics which included two soft, gooey eggs that blended in with everything else on the plate. The bacon was cooked pretty crispy but well short of burnt. The toast was simple with a spread of butter and some jelly on the table if desired. I’m pulling the potatoes out separately here because I really liked them. 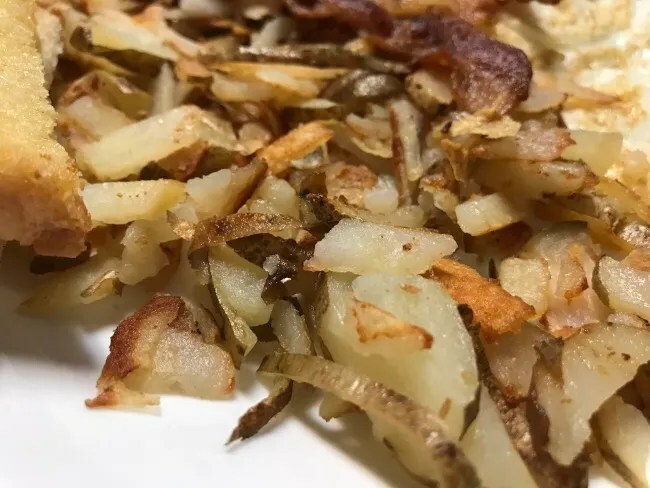 They weren’t the typical grated hash brown type potatoes. They’s were probably still machine sliced but they were a little thicker and a little bigger than traditional hash browns. There was a nice golden brown crunch almost all the way through so no disappointment of under cooked potatoes in the middle. With a little more seasoning, these greasy, crunchy potatoes would be a huge hit. The kids kept it simple like they always do. L just did toast and bacon. She easily finished off her plate and was starting to pick at mine as well. She likes a lot of butter on her toast and luckily, B got extra butter with his meal so I gave one to her. B asked several times for toast but that didn’t seem like him. I kept asking if he wanted a pancake and he kept saying toast…so I got him toast and a pancake. When the waitress brought it out, he all of a sudden didn’t want toast. 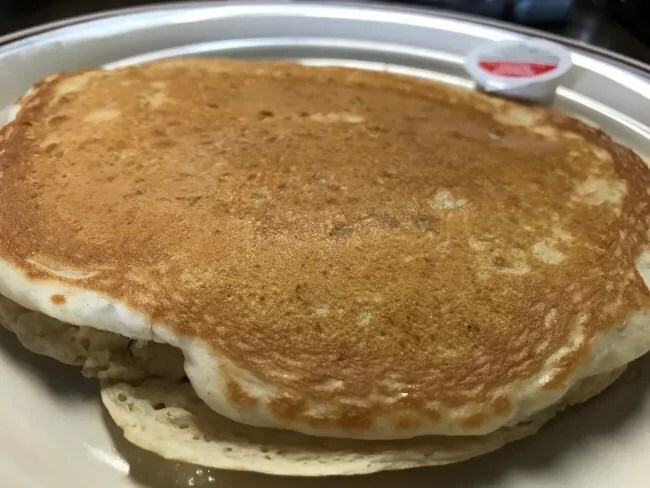 The pancake was pretty big. There is no kids menu options so this was an adult size pancake. We put a little butter on it and he ate almost the whole the thing…but totally refused to touch his toast after asking for it. L and I helped him there. The bill was a little over $20 and I didn’t have quite enough cash so I put it on my card. 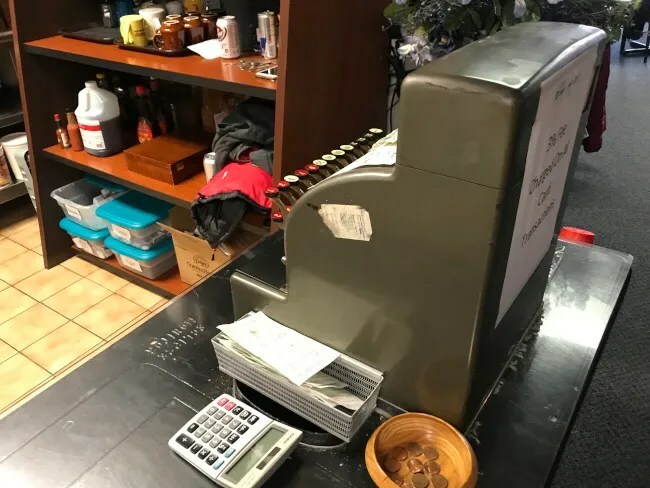 When I walked up to pay the bill at the cash register in the middle of the restaurant, I found an awesome old cash register with mechanical push buttons. Obviously, my card wasn’t going to slide in that but that had an iPad for card transactions. 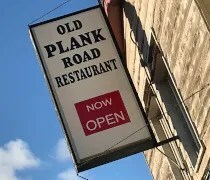 Old Plan Road Restaurant is a classic home town diner. The food is simple yet delicious. It took a little longer than I think it should have to get our food but the kids were good (for the most part) and when the food came, they devoured it like I hadn’t fed them all morning (I hadn’t).